America’s Best Soaking Walk-In Bathtubs built in the USA. Offers many features including adjustable leveling, door swings either left or right and a large 75 gallon capacity. The S5330 soaking walk-in bath provides easy access for anyone having a difficult time getting in or out of a standard bathtub. The door of the bath swings inward to avoid interference with the toilet, cabinets etc. An inward swinging door also allows the water pressure to push the door against the tubs water tight seal. The water pressure on doors that swing outward on a walk-in tub actually push the door away from the water tight seal. 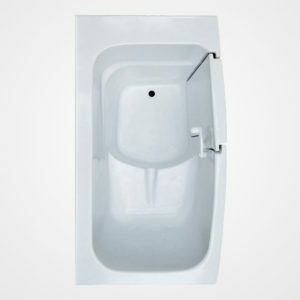 A comfortable seat is sculptured into the tub opposite the bathtubs drain and overflow. All tubs are shipped with a cable drain assembly. The bather can open or close the drain with a simple twist of the overflow cover above the water level. Faucets are typically located at the drain end of the tub. Most soaking walk-in bathtubs are ordered with an optional soaking tub heater that insures the temperature of the water remains constant.